Behaind the Scenes: How do gamma rays from thunderstorms relate to lightning? In the early 1990s scientists discovered that thunderstorms produce intense flashes of gamma rays, the Terrestrial Gamma-ray Flashes (TGFs), but we're all much more familiar with a different intense flash from thunderstorms: lightning! Scientists would like to know whether – and if so, how – the gamma-ray flashes are related to lightning. To do that, they need to compare with measurements made of thunderstorms and lightning in other wavebands. Multiple cloud-to-ground lightning strikes over Deerlodge National Forest. Lightning produces bursts of X-rays that can be detected from the ground. Because a spacecraft like Fermi can only observe TGFs within several hundred kilometers, and there are only a few spacecraft equipped to detect TGFs, we can monitor only a small fraction of the Earth's surface at any one time for gamma-ray flashes. In contrast, though, we can monitor lightning discharges around the entire globe at all times because they're like bright radio stations. A cloud-to-ground lightning strike acts like a giant radio transmission tower, and the current flowing in the discharge generates strong low-frequency radio waves. Those radio waves can travel many thousands of kilometers around the world, channeled between the ground or ocean and the ionosphere, a portion of Earth's upper atmosphere that is ionized by ultraviolet light from our Sun. Like its name suggests, the World Wide Lightning Location Network (WWLLN, pronounced like "woolen") is a network of antennas spread around the globe designed to detect the radio emission from lightning and to locate the lightning by measuring when the individual radio pulses are received at each antenna. A number of other services, both public and commercial, in the Americas, Europe, and Asia provide similar maps or more detailed regional lightning maps. Annual-mean map of global lightning showing number of lightning strikes per kilometer per year. Since this is the global average, seasonal variations have been smoothed out. 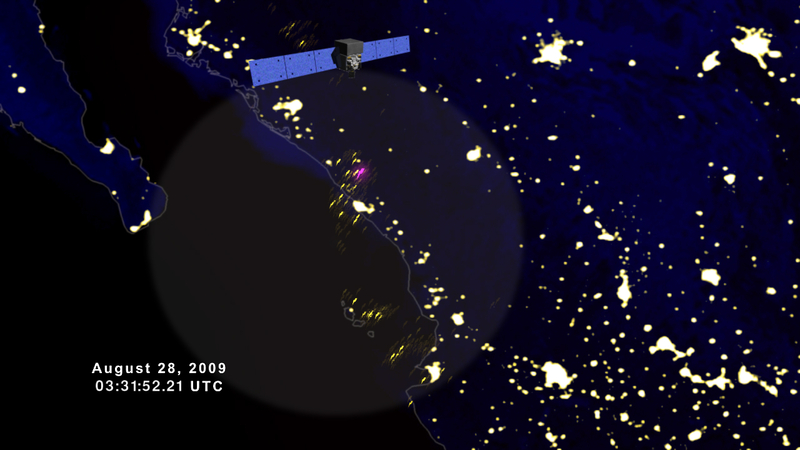 Shortly after the discovery of TGFs with the Compton Gamma Ray Observatory, scientists observed low-frequency radio bursts from thunderstorms beneath Compton a few times when it detected the gamma-ray flashes. Armed with this knowledge, scientists working with Fermi's Gamma-ray Burst Monitor (GBM) collaborated with the WWLLN research team led by the University of Washington to correlate the hundreds of TGFs detected by Fermi with lightning discharges measured by WWLLN. What they found from this detailed comparison is that sometimes a WWLLN lightning flash came a fraction of a second before or after the TGF, suggesting that the lightning and TGF were related, maybe one setting up the conditions needed to trigger the other. But other times a strong WWLLN radio burst was nearly simultaneous with the gamma-ray flash. This suggests the gamma rays and radio emission are coming from the same source: the cascade of high-energy electrons that creates the gamma rays also ionizes the air and drives a strong current that generates low-frequency radio waves, just like a lightning discharge. Meteorologists use radar to track storms and study their structure, and with Doppler radar they can measure the motion of water and ice within clouds. 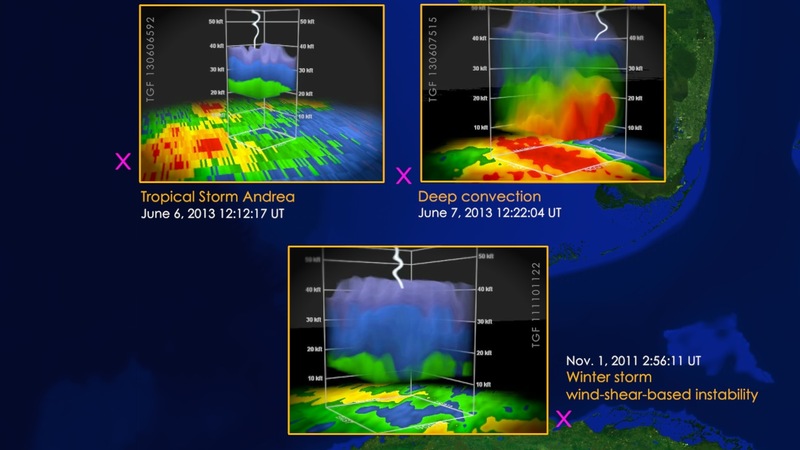 More sophisticated, modern Doppler weather radars like NEXRAD can provide detailed 3D maps of the structure of a storm and its distinct rain, ice, and snow components. By combining NEXRAD data, measurements of atmospheric conditions, and GBM data of gamma-ray flashes, Fermi scientists showed for the first time that TGFs can be generated in many kinds of thunderstorms, both early and late in a storm's life cycle, with even a hint that TGFs might be more likely as a storm ages and weakens. They were also able to confirm earlier findings that TGFs tend to occur high in thunderstorms, between about 11 to 14 kilometers high. The full story might be more complicated, though: a TGF created lower in a storm would have to travel through more air, which would weaken the gamma-ray beam enough that GBM wouldn't be able to detect the flash. Weather satellites and the visible and infrared images they provide have completely transformed our ability to track and forecast tropical storms, saving lives and protecting property around the world. Tropical storms don't make much lightning, but they do make TGFs. Fermi scientists have studied a few dozen TGFs associated with tropical storms, typhoons, and hurricanes. They've found that TGFs are more common in the weaker storms, and they can occur throughout a storm system as it intensifies. In fully developed hurricanes and typhoons, the TGFs that do occur tend to be from the outer rain bands, where most of the lightning in these very severe storms is located. During a period of rapid strengthening on Aug. 23, 2012, Typhoon Bolaven launched its only TGF from an outer rain band located nearly 490 miles (785 km) from the storm's center (roughly left of center of the full image). The Moderate Resolution Imaging Spectroradiometer (MODIS) on NASA's Terra satellite captured this natural-color image of Bolaven the following day. We've learned a lot about TGFs with Fermi. Lightning monitoring networks, weather radar, and satellite imagery have helped us understand the kinds of thunderstorms that make TGFs. But the bottom line is that we still don't understand the connection in detail between lightning and TGFs. There is still a lot to learn. If you'd like to learn more about severe storms, NOAA's National Severe Storms Laboratory has a fantastic series of lessons on thunderstorms and lightning.